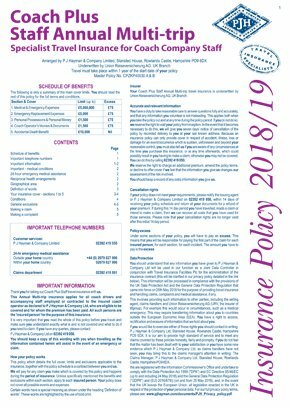 Travel Insurance scheme for Drivers/Staff/Reps etc. Note: a minimum premium of £150 (including IPT) will apply. Essential cover is provided for medical and emergency expenses, employee replacement, employee personal effects, coach operator monies and documents held and Accidental Death Benefit. Please complete the Application Form and return it to us via post, email or fax. Alternatively, call 02392 419 050 Mon to Fri 9am – 5pm. Please complete the Application Form and return it to the issuing Coach Operator, Broker or Agent or direct us via post, email or fax. Alternatively, call us on 02392 419 050 Mon to Fri 9am – 5pm. Coach Plus Travel – cover for passengers travelling within the UK or to European destinations. Last updated: 18th December 2018. Complete an Application Form or call 02392 419 050 Mon to Fri 9am – 5pm.